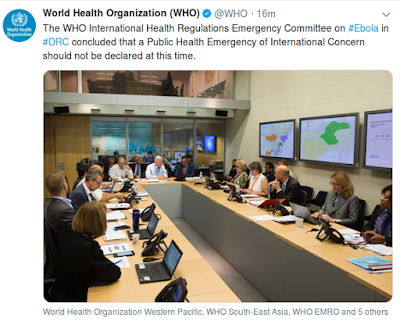 Earlier today the WHO convened an emergency session of their IHR Emergency Committee to determine if the ongoing outbreak of Ebola in the DRC constitutes a Public Health Emergency Of International Concern (PHEIC) - and if so, what measures to recommend. The designation of a PHEIC by the WHO was first proposed in the revised 2005 IHR, but the first time it was invoked was in 2009 with the H1N1 pandemic. The bar for declaring a PHEIC is purposefully set pretty high, as invoking one does have some down sides, particularly in regards to travel and trade for an affected region. Today, after considering the pros and cons, the decision was made (for now, at least) not to declare this Ebola outbreak a Public Health Emergency Of International Concern. It is a concern, they say, but is currently believed to be more of a regional threat than a global one. Below you'll find an excerpt, and a link to the full WHO statement. Follow the link to read the full statement, which includes a assessment of the Current Situation and a list of Key Challenges.